​This week is marked by Holocaust Memorial Day. We remember grievous moments of humanity at its worst. At the forefront, the slaughter of 6 million Jews in World War 2 which must never be forgotten. The film Denial, the trailer which is attached, tells the story of one man who tried to alter history and deny this evil. idloso Jews lie about everything. They are the Devil. 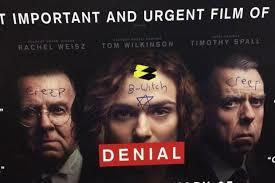 At the weekend posters of this film in London were defaced with antisemitic graffiti. But if you think that the film has simply attracted antisemitic behaviour because of its subject matter, unfortunately that is not so. Last night a Jewish university lecturer was victim of awful antisemitic attack on his own campus. At the weekend there were several antisemitic attacks on Jewish homes and communities here in London. Last week in UK there were multiple bomb threats at Jewish schools (incidentally in the US last week there were around 20 similar threats). 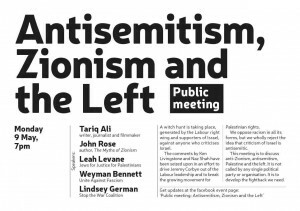 Daily there are anti-Israel meetings in universities and in the community where antisemitism is the common language and the language of choice. What do you think antisemitism looks like at Goldsmith’s College….. This is not new, but it is overwhelming. MPs, Councillors and Political activists, once suspended, have now been welcomed back into their political folds having used social media and their positions of influence to spread vitriolic hate against Jews. Yesterday, an Oxford University Labour Movement was reprieved from punishment for a vicious attack on Jewish students. This, despite the report (produced by Baroness Royall) into the incidents making very clear that antisemitism had been prevalent in the group. This has not been caused by Brexit. This has not been caused by Trump. This is a result of Jew hate being acceptable and even a viable currency in debate. This is a result of ignorance and bigotry. David Irving, the Holocaust denier (and the subject of the previously mentioned film) is once again touring to adoring crowds demeaning the memory of the victims of the Holocaust and spreading vile racism. David Icke is selling out a tour in major venues in the UK sharing Jewish conspiracy theories the like of which were last trotted out to large audiences in the 1930s by fascists. A Jewish newspaper puts the Al Jazeera sting into perspective…. No sh*t Sherlock! Yet that did not stop the Leader of the Opposition calling for an inquiry and at least one national newspaper screaming front page headlines. The international community has bolstered Jew hate by, amongst other acts, condemning Jews for their inalienable rights to a homeland and its defence. So much so that the most precious and holiest site in Judaism, the Kotel (The Western Wall) in Jerusalem has been deemed by the UN a site of Arab ownership and Islamic control. Not even referred to by its Hebrew name, but an Arabic one. And at that same UN, more hyper critical resolutions against the Jewish State have been made than against the rest of the World combined. Yes, more than against Syria, North Korea, Iraq, Iran, Saudi, Venezuela, Yemen, Sudan, DR Congo, Russia, Turkey and the rest of the World combined. These are contemporary samples of life in the UK as a Jew and the exhausting hatred that surrounds and addresses us. I could quote countless other examples that have occurred in the last few days. Most of my Jewish friends are acutely aware of this and perhaps a few of my non Jewish friends are. I am not usually one for sharing my personal opinions, but in this case I am even less comfortable ignoring and hiding them from view. 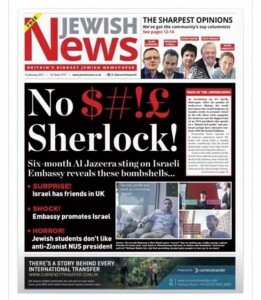 Be under no illusion, hating and abusing Jews is becoming the norm and many of us can see the writing on the wall…. both literally and figuratively. This entry was posted in Uncategorized and tagged antisemitism on January 24, 2017 by admin. The Labour Party is carrying out an inquiry into antisemitism in its ranks to see if it really exists. And whilst poking around they’re going to check if they hate other stuff too. Why not, indeed? Heaven knows why it’s antisemitism “and other stuff”. But I guess when there’s no antisemitism to be found they might as well use up the time looking for Islamophobia, which is the “other stuff” in question. This entry was posted in Uncategorized on June 2, 2016 by admin. Those pesky Jews…… sorry Israelis. They know how to make antisemitism work for them. Over the next few days you will see various posts and feedback from a meeting held in Birkbeck College, London. Amongst the motley crew of decent Left leaning statesmen (or should that be states-people) were representatives of Jews for Justice for Palestinians, Stop the War, Unite against Fascism, veterans of the Left and the culture angle from Tariq Ali. Others, such as David Collier, Jonathan Hoffman and Richard Millett, will write excellent political analysis of the events of the evening and bare witness to the hate. Chief amongst the victims of this malevolent antisemitic myth, Jeremy Corbyn. If it wasn’t for those pesky scheming Zionists (insert Jews and Israelis) Jeremy would be sailing through to power with an overwhelming majority. If it wasn’t for those conniving zio lobbyists, Jews wouldn’t have such a hard time with real bigotry. If it wasn’t for those manipulating Jewish politicos (like Mark Regev) controlling the media airwaves there wouldn’t be a Jew hater in site and if wasn’t for those murdering Israelis killing Palestinian children with gay abandon, Jews the world over would be safe and loved by every decent human being. And of course, if Israel would just let all those 6, 7, no, 8 million Palestinian refugees from around the world back in to Palestine and let the resulting Arab majority decide what should become of the Israel, then there would be World Peace. Of course, as we were told by Tariq Ali, no less, the Muslims have a great history of caring for and working with the Jews (albeit he conveniently forgot the near million that were forcibly exiled from all parts of the Arab world around the same time as the State of Israel was created). As those of you who follow me know, I’ve been writing to Jeremy Corbyn and some of his colleagues for the last 9 months or so on an almost daily basis about his “antisemitism problems”. His personal relationship with it, his allies, parliamentarians and councillors in the Labour Party who freely bandy antisemitic tropes and his loyal membership who preach antisemitism without a care for who hears it and what they think. Labour will state that anti Zionism is legitimate and is NOT antisemitism as it is the right of anyone to believe that Jews should not have the right to self determination, except they will call it “legitimate criticism of Israel policy”. 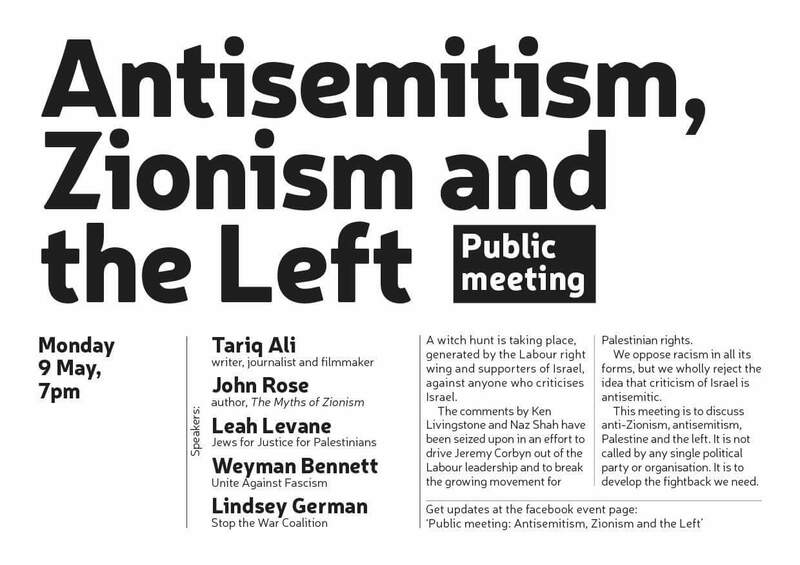 Birkbeck College tonight was the inner sanctum of Israel-, Zionist- and Jew-hatred. There debating what antisemitism is, were the foot soldiers of the new antisemitism. 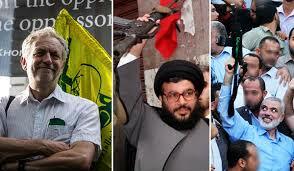 As a tidy dénouement to tonight’s episode, I recalled being sold that Hamas book. I wondered whether I could buy a copy of this terror manual on line. Sure enough Amazon would not sell such a hate ridden and vile book, but the Amazon marketplace has everything for sale. There I found a copy for sale from a source close to the heart of Jeremy himself. Corbyn, had, a few years previously vehemently defended a leading member of the Anglican clergy who had made mendacious antisemitic statements. The church suspended him, just like the Labour party now does with its bigots. The clergyman and the book seller were one and the same, Stephen Sizer. Thus rounding off neatly a night of Jew hate. This entry was posted in Corbyn, Uncategorized and tagged Anti Semitism, British Labour Party, Israel, Jewish, Palestine on May 10, 2016 by admin. There is much confusion and concern regarding the ongoing scandal of antisemitism in the Labour Party. We have watched in disbelief as Labour Party members have shown their darker side with outrageous bigotry directed at Jews. But have we really understood what is going on? But maybe, just maybe Shah’s tweet to an Israeli footballer was nothing more than a mild jibe at a Jew and Israeli footballer, which was completely understandable given Shah’s outrage at the fact that he considered all Israelis child killing Nazis (except perhaps the 20% who aren’t Jewish). “a witch hunt and all because I am a Muslim”. How foolish this whole “Labour antisemitism” thing is. Simple, it is all just a cover up. Shah Hussain has revealed that the Labour Party is getting away with outrageous Islamophobia by making out that Shah and many like him are antisemites. This is a perfect slur. How did we miss that….. A Jewish and Labour conspiracy with the Islamophobe in chief, Jeremy Corbyn, masterminding the whole conspiracy. He just wants to make these poor Muslim politicians suffer by calling out perfectly innocent bigotry as racism! Yet Jeremy’s real friends are rallying around him. They know how to be real Jew haters. Not some “plastic bigot” like these poor political victims. JC’s friends, well, I say friends…. A spokesman for Hamas has now hailed Mr Corbyn for his refusal to condemn the terror group. Taher Al-Nunu said Mr Corbyn’s willingness to engage with it was a ‘painful hit that the Zionist enemy received’. ‘We welcome the declaration of the Labour Chairman and see his engagement as a very important statement. But wait until Hamas find out what an Islamophobe he has been to the good and the great of his own party suspending Hamas and Hezbollah supporters up and down the land. Surely then Hamas and Hezbollah will come rolling in to the UK in defence of the embattled “innocent 50″ Labour politicians, councillors and party workers. Maybe this is the predicted coup come from the friends of Jeremy? We’ll know shortly. This entry was posted in Corbyn, Uncategorized and tagged Anti Semitism, British Labour Party, Corbyn, Jewish, Palestine, Terrorism on May 3, 2016 by admin. Probably by now this should refer to Ken Livingstone, ex-MP. The suspended and somewhat disgraced MP had done his research into the myth of antisemitism in his beloved party. He’d clicked on Wikipedia to find why everyone thought that there was a conspiracy to accuse his beloved Party of antisemitism (which according to Ken is not racism). Then he stumbled on it. Let’s be clear, in the 1930s in Germany, of course Jewish leaders would try and negotiate with Hitler to ensure they did as much as possible to prevent the ensuing atrocities (albeit they could not have imagined what lay ahead). There was a time in the early 1930s when Hitler thought Jewish ethnic cleansing of Germany by removing all the Jews (whilst appropriating all of their possessions and wealth) and packaging them off to the Middle East had some traction. He explored and considered many options in how to deal with the “Jewish problem”. Judenrein came in all shapes and sizes. 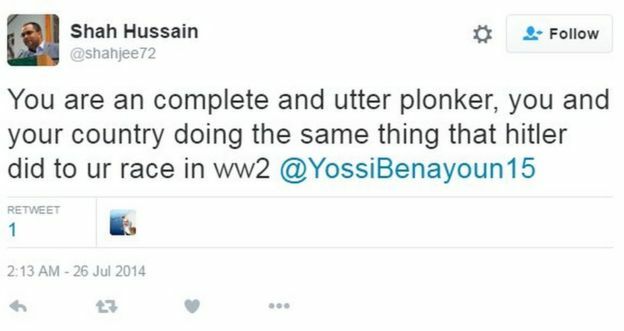 But, consistency was the key, consistently wishing to exterminate Jews. That he plumped for a more “finite solution” to what he considered the Jewish problem just shows this as part of his clinical maturing thinking. He also made approaches to leaders in the Middle East, such as the Grand Mufti of Jerusalem and other Arab leaders as to how this could play out. Whilst some saw through his evil designs others were willing to go along with them and even invest and execute them with gusto. The Grand Mufti of Jerusalem was indeed pleased to plan industrial level extermination camps in the region to rival anything the Nazis could do. His sycophantic behaviour towards Hitler has been well documented. Back to Ken Livingstone. The fact that Livingstone wanted to associate Hitler’s ethnic cleansing strategy with Zionism and say “well see, he was in favour of Zionism” is a very sick joke. No, Livingstone is a nasty racist who finally showed his true colours and relished it as the attention seeking weasel he is, lapping up the ensuing media scrum and touring the studios in a most ungracious aggrandising manner. 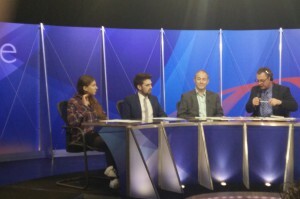 John Mann, despite also knowing that this was a bit of a media stunt, intended to expose Livingstone and bring the problem to the surface because he was sick and tired of his party leader, Jeremy Corbyn, saying antisemitism doesn’t exist in the Labour Party (amazingly still saying so, claiming this is jealousy of his success causing it). And this, knowing John, is surely true. I met John Mann in October last year. Just the day before I had attended a public meeting (with my friend and fellow blogger David Collier) where Sir Gerald Kaufman (Labour MP, and the “father of the House”, a moniker given the to oldest statesman in the House of Commons) hosted and spoke. This, in the rarefied confines of the offices of the Houses of Parliament. 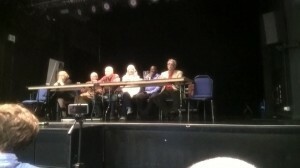 The meeting was for the Palestinian Return Centre, a group promoting the notion that all people of middle eastern decent and who are Arabs, have the right to claim Palestinian citizenship. (As a Jew, I remained incognito for fear of a hostile reaction and censured opinion). Under the roof of our country’s political home Kaufman posited how wealthy Jews control British politics. Of course, this is a classic anti-Semitic trope which was delivered with vitriolic fervour and roundly applauded by an equally opinionated audience. At the time, when I spoke to John Mann, he looked furious because, I believed, he felt I had information which was damaging to his party, the Labour Party. Now I realise (and should have at the time) he was furious because he can’t abide antisemitism such as that espoused by Kaufman and now Livingstone, full stop. It is a depressing decline in the Left. And one for which I am deeply saddened. A strong opposition is always vital to good government. Jews have always found good companionship on the Left. But rather like Hitler’s plans to ethnically cleanse Germany of Jews, Corbyn seems to be achieving the same end for Labour’s political landscape. But today, he’s one henchman shorter. Jeremy Corbyn, the Labour Leader, reacted to all of this by saying people were jealous of him and his party. Frankly, this looked like madness. He extolled the grass roots of his party and thought that the anti-Semitic conspiracy / crisis was created to undermine and sully these roots. But wouldn’t those roots include Jews? Corbyn: “I suspect that much of this criticism about a crisis in the party actually comes from those who are nervous of the strength of the Labour Party at local level”.So the Jews offended by Jew-hatred and antisemitism in Labour are actually just trying to damage the Labour party because it is powerful? Maybe Wikipedia will find a new entry for the Haavara Agreement, the Labour Party Haavara Agreement which brings it up to date with expatriation of Jews from a political movement. Dispossessing Jews of their right to self-determination of hatred and instead accusing them of making up a narrative to suit their own gains and jealousy in the success of the Party without them. As Livingstone said when trying to excuse himself of antisemitism (which incidentally he says is NOT racism), this was “all in the 1930s before the Leader of the National Socialist Party went mad”. Jeremy Corbyn’s eyes looked a little more furtive and crazed as I watched him be interviewed yesterday. Maybe the madness is contagious if you behave like this. This entry was posted in Corbyn, Livingstone and tagged Anti Semitism, British Labour Party, Corbyn, Israel, Jewish, Livingstone on April 29, 2016 by admin. Yachad’s leader, Hannah Weisfeld’s backdrop to her Op-Ed in Haaretz was the awful events of King’s College and the talk promoted by Yachad delivered by Ami Ayalon. However, she sees British Jews too shutting down free speech. But she qualifies this with “shutting down free speech when it is the voices critical of Israel”. I was lucky enough to hear Ami Ayalon speak the previous evening. Whilst I found plenty to disagree on, it was clear that ultimately we all want pretty much the same thing. A lasting truce with security for all, a civilised distribution of boundaries, prosperity for all and an end to the mutual hatred and mistrust. Our journeys might be different, but our goals are not poles apart. The following night, of course, we witnessed a whole different kind of evening where difference of opinion was expressed with hatred, racism and violence. Yet Hannah’s Op-Ed was not only condemning the suppression of freedom of speech that took place at Kings College. She drew moral equivalence to the protests by “right wing Jews” objecting to the views of Ami Ayalon at the following evening’s engagement in Manchester. Hannah was outraged at that Jews could discuss the nature of a public speaker on the left through a closed Facebook site and that these Zionists had the audacity to send in emails asking for the speaker not to speak. And that “despite the intense pressure” of some emails and a closed Facebook site the talk went ahead in a civilised and law abiding way. No need for police, no need for protection (well not from a few Zionists anyway). “Anyone knows…how f*cked up the Shin Bet and anything that has to do with the Israeli occupation is, or is aware of how much whitewash is involved in these hasbora events” and “support the Palestinian call for an end to apartheid”. The comparison made by Hannah could not be more wrong or offensive between the two instances. The KCLAP’s vitriol versus a closed Facebook group and a few hasbora activists. Broken windows, flying chairs and assault versus some strongly worded emails. Hatred and racism versus pro Israeli opinion. In the grand debate some people I know wish speakers not to speak for fear of confusing or conflicting with their steadfast opinion. But none of them revert to violence. Indeed the only instance I have seen of possible suppression of free speech recently may have been the blocking of Tuvia Tenenbaum at Limmud (because his opinions don’t conform). But it should come as no surprise that those on Hannah’s side of the political fence can play the intimidation game too; and generally with at least as much if not more vigour and self righteousness. Perhaps Yachad are not so incomparable to those who could not tolerate Israelis and Jews having oxygen like those haters at King’s College. Recently, an event was arranged with a world renowned author and authority on many aspects of Jewish history and politics. He has upset some on the left of Israel’s political divide due to his exposé on Machiavellian going-ons within certain NGOs and left wing organisations operating in the Jewish / Israel / Palestinian arena. He was scheduled to speak at a Progressive synagogue. When the event publicity came out, intimidating noises and complaints came from members on the left and threatened to bring the event down. In fact the talk was actually about the persecution of Jews in the Arabic regions; a story that has nothing to do with politics and everything to do with the persecution of one million Arab Jews last century. This is a story that should be close to the hearts of all Jews. Yet despite this being the subject matter, there was, as we would say, quite a “broigus” and many of the congregants stayed away rather than learn about one of our darkest periods in Jewish history and the heinous denouement to the Holocaust with this second wave of persecution. Of course, none of this broigus translated to the event, which went off peacefully and hugely successfully. And so back to Hannah’s Op-Ed in Haaretz. It is cynical, duplicitous and dangerous. It shows Hannah’s and Yachad’s true colours. They would treat their political opposition as their enemy with intolerance and their enemies as their friends with appeasement. A very wise friend of mine told me this story. There was once a well known British Left wing Jewish politician. A child of World War II, the State of Israel was his birth-right. He loved Israel with all his heart. It was the perfect ideal, the Jewish homeland. It was his utopia. But when he realised his utopia was flawed and not as he had dreamt it, he blamed his fellow Jews. He hated those Jewish settlers, Zionists and right wing hawks who had ruined it for him. He could not forgive. So it is with Yachad. If they can’t have their utopian dream, its ruins lie at the feet of the Zionists and the right. And the haters and the anti-Semites, well they are just the consequence. If it wasn’t for those Zionists we’d all live happily ever after. And that is self serving politics of the first degree. This entry was posted in Uncategorized and tagged Israel, Jewish, Palestine, Yachad on January 22, 2016 by admin. The queues outside the Houses of Parliament were longer than usual. A five minute security check had become 35 minutes. And the presence of more armed police was also notable. The reverberations of the events of Paris were clear to see for me and my fellow queuers. Once through the mandatory checks, now armed with nothing more threatening than my lanyard and visitors pass, I wondered through the Great Hall and onwards and upwards to Committee Room 14. One of the great privileges of being British and one of the remarkable things about our “home of government” is that any visitor is entitled to wonder through our ancient vibrant seat of political power freely (as long as you remember to display that visitors pass). This is liberté…. I took my seat in Committee Room 14 and settled in as we were welcomed by the ever charming Guto Bebb MP, and introduced to the Spanish ambassador and her entourage and the erudite and admirable José Maria Aznar, Prime Minister of Spain from 1996 to 2004. Here to talk about Israel, the indomitable friend of The West. This is fraternité…. And so it was that Senor Aznar explained in the simplest and clearest of terms how just one simple perspective change matters. “Judging Israel by standards that are not only impossible to fulfil, but also that are not applied to the rest of nations should not be accepted as normal”. This is egalité…..
Liberty, Fraternity, Equality. An anathema to the terrorists and the haters, but personified in the words of José Maria Aznar. And with the events of Paris still raw in our hearts, he talked with a balance of sentiment and structure somehow missing from much of the mesmerising rhetoric and hysteria surrounding us since that awful evening. Please take the time to read Israel: A Vital Asset of The West. All we want is a normal and reasonable conversation about Israel. Surely, that is not too much to ask. Postscript: Sadly, as I returned to my office that afternoon, I read news from Spain of another moral inequality (http://www.israelnationalnews.com/News/News.aspx/203574). It would appear that a Spanish judge had ordered the arrest of Netanyahu and seven other current and former government ministers in relation to the actions of Israel and the Mavi Marmara. Despite the fact that four legal enquiries had not found against Israel’s actions, this judge appeared to be making a legal exception to the Israeli officials. Holding Israel to a different account, just as we discussed. For all the positives I left Committee Room 14 with, this brought me back down to earth with an unpleasant bump. As Senor Aznar remarked, a perfect example of “sentiment over policy”. But I remain hopeful whilst there are people like Senor Aznar rooting for Israel. This entry was posted in Uncategorized and tagged Friends of Israel, Israel, Spain on November 20, 2015 by admin. There is a very simple problem with anti-Semitism in the UK and Europe. We don’t know exactly what it is. What is a Semite anyway? And what does being anti-Semitic mean? A Semite could be defined as “someone who belongs to the Semitic peoples. The Semites are supposedly descended from the biblical Shem, the eldest son of Noah.” But these decedents include Jews, Muslims, Christians and many Middle and near Easterners who derive their beliefs through the Abrahamic faith lineage. And being “anti” something or someone, could mean being a rival or being opposed to. But this is a very confused picture which suggests that Anti-Semitism literally means being “opposed to the descendants of Shem”. So does an anti-Semite oppose most of the Middle Easterners? Anti-Semitism is a certain perception of Jews, which may be expressed as hatred toward Jews. Rhetorical and physical manifestations of anti-Semitism are directed toward Jewish or non-Jewish individuals and/or their property, toward Jewish community institutions and religious facilities. In addition, such manifestations could also target the state of Israel, conceived as a Jewish collectively. Anti-Semitism frequently charges Jews with conspiring to harm humanity, and it is often used to blame Jews for “why things go wrong.” It is expressed in speech, writing, visual forms and action, and employs sinister stereotypes and negative character traits. A recent survey proposed that only North Korea is more unpopular than Israel. British students have been celebrating ‘Israel apartheid week’ with open anti-Semitism, intimidating those who try to voice any objection to their spite filled views. British universities can run completely one sided symposiums questioning the very existence of Israel with the full approval of their academic governors and peers. British MPs can issue legal proceedings against individuals who correctly identify anti-Semitic narratives they have espoused. British peers can use blood libel tropes in speeches within the Upper House of government with impunity. Charities openly siphon funds for politically active terror groups involved in attacks on Israel. See, that’s the thing. Anti-Semitism doesn’t really tell you much. It’s anodyne, it’s anonymous, it’s unencumbered by connotations and it’s guilt free. Call a person a JEW HATER and the guilty are left in NO DOUBT of their crime and the victim is clearly identified. The Jew is the victim. It says it all, and it says it concisely and to the point. The time will not come until Muslims will fight the Jews (and kill them); until the Jews hide behind rocks and trees, which will cry: O Muslim! There is a Jew hiding behind me, come on and kill him! So kudos to Hamas for their honesty. They know better than most how to be anti-Semites… correction… JEW HATERS! 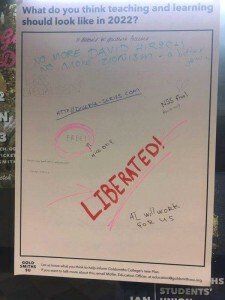 This entry was posted in Uncategorized and tagged Anti Semitism on March 16, 2015 by admin. Let me start with a simple and humbling story. In London, where homelessness is an increasing issue, many of you will have walked through the streets of the city and seen sleeping bags, cardboard boxes and newspapers piled up next to heating vents and alley ways. I am privileged to run a homeless shelter in my local borough and along with some wonderful volunteers we provide, through a network of synagogues and churches, the food, warmth, bon homie and shelter for the less fortunate. Generally, it is a happy and pleasant time spent with decent people. I usually think “there but for the grace of G-d, go I” as we are all just a few steps away from disaster or success. Then, just occasionally I meet someone, they tell me their story, and I am humbled. A middle aged South African lady turned up at our shul shelter last night. She was on the list of guests, but she was late. In fact, had she been half an hour later, we’d have been closed for the night with all the guests snuggled up in their sleeping bags on the floor. However, she was just in time. She was cold as it was a miserable winter’s night in London, rainy, cold and windy. It was late. Dinner had been served and guests were already bedding down for the night. So I made Hilda a cup of tea. She’d missed dinner, so I rustled up cheese, toast and cold veggie sausages. As we sat and chatted she told me that she’d have to be up at 4am to go to work the next morning. And then she’d be back at lunchtime; then she’d be off again until 10pm for work. From 4am until 10pm travelling and working. She had to catch 4 buses to work, 4 buses back to a lunch shelter to collect her night shelter voucher, 4 more buses back to work and 4 buses back. We worked out how to help her not have to travel back so she could do another job over lunch. Then she could afford a hostel, and then she could get a little more independence. I felt proud to help and humbled in her company. Our synagogue is a proud provider of a community shelter. It works with different synagogues (United, Reform, and Progressive) and churches (Catholic, Church of England and others). We hope to add a mosque to our roster next season. We show how a multicultural society all has the same community spirit and values. It shows that we can work together and put aside our differences for the greater good. Last week I stood outside the gates of my synagogue in London. I watched our children at the Sunday school practicing their terrorist evacuation procedures within the grounds of the building with its enhanced security systems, high wire fences and toughened glass. I watched as the police car patrol did its rounds, the CST officers in their bullet proof jackets did their checks and the synagogue’s own hired security did perimeter inspections. And me, just an ordinary Jewish Londoner, at those gates doing my voluntary duty, just like the man on Saturday night in Copenhagen outside his synagogue. Fear, life and death as a Jew in Europe today. In essence, the PSED requires councils to have regard to the impact on community relations before exercising any function (flag-raising included). This action would clearly significantly damage community relations. (c) foster good relations between persons who share a relevant protected characteristic and persons who do not share it. It is, I’m sure you’d agree a truly grotesque policy. You raised a flag of a nation who support this. This murderous tirade and policy applies to all Jews, both your family and mine. There are powerful legal positions and reasoned thinking that ensures that actions such as these are not appropriate for councils and their employees. But also, it shows what we are learning. A year ago I didn’t think I could take on a Council in another part of the country with a legal argument or persuade with depth of knowledge and reason. I, like many others, have found a voice and an inner strength and energy which I never knew I had. This entry was posted in Uncategorized and tagged Anti Semitism, Homeless, Israel, Jewish on February 26, 2015 by admin. Last Thursday, 5th February the circus came to town. 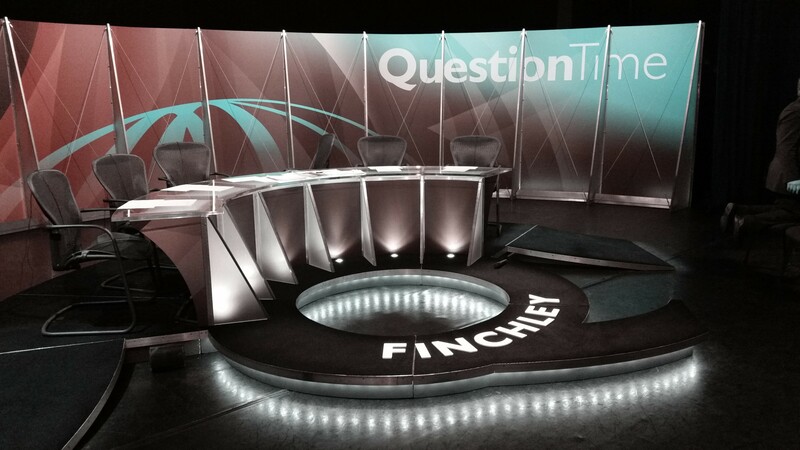 In this case the town was Finchley and the circus was that venerable BBC TV political panel debate programme, Question Time. Thursday nights in the Bond-Ryde household usually reverberate to the sound of my wife and I discussing the on screen diplomacy or lack of it by various political VIPs. But our house remained quiet this Thursday as, rather than debating with the TV we got to participate first hand in the audience. Before I go any further I should say that whilst we can be particularly vocal in our debates and reactions when behind our own front door, when we are in a public space we behave with the dignity and respect as decent people do. And this extends to a debate on the BBC. Even if the auditorium and panel contains individuals who I would not welcome into my home, let alone my sphere of conversation. So the good folk of Finchley turned out on a freezing cold evening to “chew the political fat” with some of Britain’s best known political faces. And as we supped on the pre-show coffees and munched the pre-show biscuits, the 150 or so men and women discussed what we would ask, what did we think would be asked and how the panel would react. The real reason for such excited discussion was, of course, the make up of the panel. Now why, do you suppose the BBC would put a show on in the middle of the largest Jewish constituency in the UK with a politician who, well, doesn’t have much in the way of anything nice to say about Jews and Israel? At 8:30, the circus commenced. It started quite pleasantly, despite the freezing conditions due to the broken heating in the theatre. In fact it was no surprise that the debate wasn’t heated, it was sub zero! The first question was about business and the relationships of political parties to the entrepreneurial society. Plenty of hot air from the audience and panel started to raise the temperature into the positive Celsius. The next question was about education and the reduction in funding. It got us warmed a little more. Everyone knows that education is at the heart of the Jewish community so it certainly got the temperature rising. Then, the moment the broadcasters had been planning for…. the question that we all knew would turn up the climate to tropic heat. 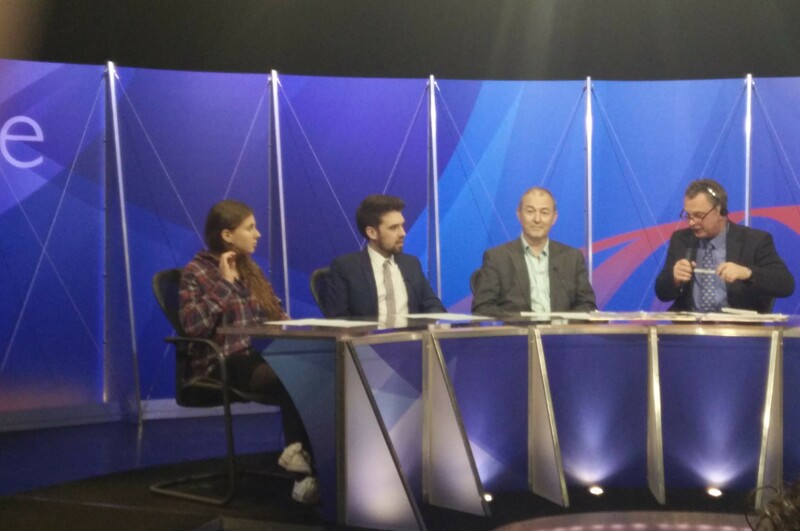 A young man, a cheeky smile starting to appear said “What does the panel think of the rise in antisemitism”. But, he added (unscripted to the question agreed) “and is one of the panelists in particular responsible for inflaming this issue”. So it was that the mob started to rule the debate and the show really began. Firstly, Jonathan Friedland was allowed to respond. Now Jonathan being Jewish spoke eloquently enough. Although he made one large faux pas in referring to the summer’s events in the Middle East as the “conflict in Gaza”. Jonathan, do you not realise that the conflict requires two to tango. It was the conflict between “Israel and Gaza”. This shocking error showed Jonathan’s newspaper bias. The Guardian, for whom he writes, continually appears to side with the Palestinian cause and is often at the forefront of criticism of Israel. Nonetheless, moving on, Jonathan showed a clear demonstration of the concerns of Jews in the UK and Europe with respect to the rising tide of hatred that Jews are having to endure and the lack of traction in dealing with this until very recently (when many feel it is already too late). Jonathan having made his points, the ring master, Jonathan Dimbleby, turned to George Galloway and asked for his thoughts. Thus debate turned to debacle. Probably about a dozen or so people in the audience began to bate George Galloway and the whole debate took on a ridiculous Jerry Springer style. Sadly the opportunity to do some good for our community, to raise issues that would have shocked the viewers and to to see George Galloway entrap himself in his own hatred was squandered. No one exposed him for his racist remark about the make up of the audience. There was no unmasking his inability to differentiate between zionists and Jews (despite tying himself in knots trying to deal with that). What we got instead was a bunch of loud mouthed individuals yelling uncontrollably (in the name of our Jewish community). And to my mind doing the credibilty of Jews in the UK no good and, sadly making George Galloway look, yet again, like the victim! So here’s my letter to George. 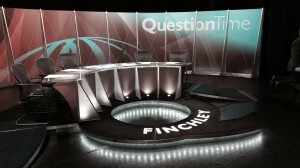 I was in the audience at the Question Time in Finchley last night. Whilst I may not be your biggest fan, may I say how engaging you were compared to the other panellists. You were entertaining and made for compulsive “TV viewing”. Like you, I was immensely disappointed to experience the “rowdy” and “unruly” behaviour of a small but vociferous element of the audience (I think it was no more than about 10 people, but they hijacked the debate). What a pity, as it really meant that a full and challenging discourse could not be held. I am copying the Production Company, mentorn.tv, who should be able to forward to Mr Dimbleby (as chairman). I was disappointed that, as the chairman, he did not take more care to ensure that the debate was managed properly. Disappointingly it gave the “loud mouths” the floor because they shouted. In debates that I have managed they would have lost the right to speak. Why didn’t Mr Dimbleby simply say “if you shout, you’ll be ejected or loose the right to ask a question”. What do you think? Do you think Mr. Dimbleby was setting you up? Setting us all up, maybe? ■ Why the BBC is not prosecuting one of its own for publicy broadcasting antisemetic views? ■ Why the worst attacks on Jews and other civilians seem to be prevalent from extemist Islamic sources (not from a provocation point of view, but simple statistics). This is a hard question, I know, but it was an elephant in the room, although one person did mention it? But it would have given us a chance to hear your views on Islamic extremism (again, I expect you have some very profound insights). ■ Why politicians (and honestly, NOT reference to yourself, but the likes of Jenny Tonge) are able to get away with clearly antisemitic tropes with impunity? ■ And finally, what can we all do to make Britain a safer place for Jews? Your reference to a balanced audience was “uncomfortably close to being racist”. It is a predominantly Jewish area therefore why wouldn’t it be representative? If you were speaking in say, Hounslow, I think it would be reasonable to expect a larger than national average audience make up from historically Indian immigrants for example. Surely not a surprise, but I suppose given the unruly behaviour a few heated and awkwardly placed comments are understandable. Do you think, in retrospect, this comment was inappropriate? 2. Terminology of a Conflict. Please note that, unlike the panel, I correctly refer to the conflict as “between”, as conflicts indicate more than one entity. Saying the conflict in Gaza is grammatically and intuitively incorrect. Would you agree that the conflict was between Gaza and Israel? c. Numbers can be very emotive and not condusive to the inherent argument. If Israel had not significantly invested in protecting its civilians (defensive strategies rather than offensive strategies, unlike Hamas who operate an almost exclusively offensively) the mortalities from Hamas rocket fire would have likely far outweighed the tragic deaths in Gaza. One successful rocket strike on a tower block in Tel Aviv could have caused a single statistical death toll to rival 9/11. And Hamas’s explicit and unwavering strategy was the targetting of civilians (let’s not forget that is a Human Rights breach, by anyone’s standards). So I am disappointed that you felt moved to use emotive numbers rather than us all participate in an impartial debate. Do you feel that quoting numbers is not appropriate for a balanced debate as it disguises the real events, criminals and victims? I do understand your reason for raising the issue. As the shouting escalated, your felt the need to show that you were (again) the victim of your reputation. And quite rightly, the person who shouted “surprised?” was foolish. No excuse for personal attacks and every right for freedom of speech. I’m sure that extends to the Hebdo terrorist murders (which I noticed you called “affair”, why so?) and Hebdo’s right to freedom of speech, as long as legal. Offence is acceptable and in my case, even as a Jew who finds it hard to reconcile some of your opinions, as long as speech remains the right side of legal by our country’s laws then its fine by me. You use Zionism as a “dirty word”. Why would a love of a country (in this case, Israel) be somehow soiled. In an imaginery world, pretend there was a word “Turkeyism” or “Suliemanism” which referred to the love of Turkey. If I made use of these words to portray Turkey (a Muslim state), where there was an illegal occupation (in Cyprus), the highest levels of journalist imprisonment on the globe and the main gateway for terrorists with ISIS as an evil axis and held Muslims of Turkish heritage and all other Muslims accountable in the UK we’d be in a bad place. Please use the word Israel if you mean Israel. Zionists have a right not to be conflated too. And by using the word Zionist, you and I both know it will simply be read as “Jews”. This despite the fact that I have many non-Jewish friends here in the UK and elsewhere who would call themselves Zionists. Will you, in future, choose your words more carefully to avoid igniting old hatreds by referring to Israel not Zionists? Sadly your point on ritual slaughter, a fair an correct one got drowned out in the volume of other over emotive moments. I think, along with circumcision, reasonable ritual activities should be protected. Although, I have read worrying evidence of a significant increase of FGM (which is definitely not reasonable) in the Islamic communities here in the UK (and the recent court case in London about a doctor performing such at the Whittington Hospital, a location where many of the audience are likely to have gone as it is very local would have been good for topical debate), so we also cannot give this over entirely to the control of the religious zealots who might push some boundaries too far. And I think your point could have prompted a really interesting discussion about where to draw the line. Again, I’d be interested to know your thoughts on the relationship between religious orthodoxy and where it goes to far. FGM, honour killings, burkas? You made the reference that Israel had created a “prison” situation in Gaza. I presume this is based on the security walls between Israel and Gaza. If so, you surely neglected to mention that Egypt is also responsible for doing the exact same. In addition, those with “right of return” to Jordan are being denied by the Jordanian government thus keeping Jordanian Palestinians in Gaza (hundreds of thousands of them) for purely ethnic reasons. Why didn’t you mention Egypt and Jordan when referring to Gaza prison? You made it all Israel’s fault which is clearly not the case, would you agree? Would you accept Jordan and Egypt are equally culpable for your description of a Gazan prison? And just as a final point to the “prison” remark, the ethnic cleansing by Syria of Palestinians and their appalling treatment in Lebanese camps means that, paradoxically, those in Israel probably have the best living status and conditions. Indeed, outside of Gaza Israel is the only country providing additional medical care for Palestinians (including recently some of Hamas’s leader’s own family members). Would you agree that Israel is undermined and unjustly demonised consistently by those ignoring the good in Israel and the bad of its neighbours? I would really welcome a response and I hope you receive this as proof that there is no need for raised voices just a healthy discussion and thoughtful consideration of both sides. Finally, you were bang on on one point…. it was bloody freezing! It’s amazing that any debate made it to “heated” considering the climate! It is highly unlikely I’ll get a response? George doesn’t usually debate with Zionists. Is he some sort of force of evil? I don’t think so. Much more the pantomime villain and circus clown. But if the circus comes to town again, clowns and all, I don’t think I’ll be running off with it. I think I’ll stay at home and watch it on the little screen and go back to shouting at the telly with Mrs Bond-Ryde and a cup of tea. This entry was posted in Uncategorized and tagged Anti Semitism, BBC, George Galloway, Israel on February 14, 2015 by admin.